One-hundred and fifty-one miles. 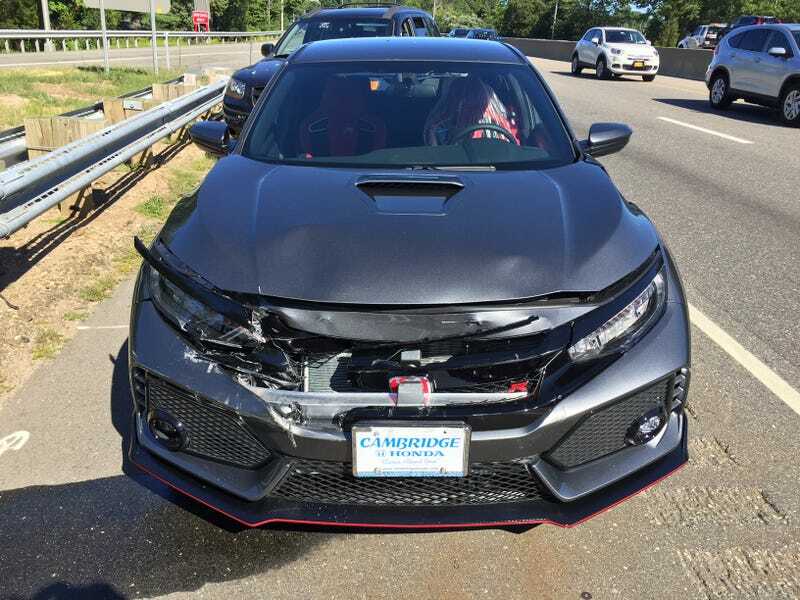 That was all Greg Ellingson got with his brand new 2017 Honda Civic Type R. He flew from Philadelphia to Boston to pick up the car, and not much later on Sunday, he was sulking through a five-hour ride home in a tow truck. Ellingson’s story, which started blowing up on Sunday afternoon after he posted about it on Facebook, is an especially painful kind of heartbreak that resonates with anyone who’s ever been excited to get a new car. The good news is besides the Civic, hearts were the only thing broken here. Ellingson told Jalopnik he was thankfully unhurt in the crash, as was the other driver he said wasn’t paying attention and hit him from behind and then pushed him into another car. Ellingson said he flew from Philadelphia to Boston on Sunday, got picked up by a salesperson with the paperwork already done. All he had to do, he said, was slap on a plate and drive it home. The car had 12 miles on it when he picked it up. “Didn’t even see him coming,” he said. Again, he wasn’t hurt, and neither were any of the other drivers. But the Civic sustained some pretty severe front and rear-end damage, and it had to be towed home. So what’s next? Ellingson said he’s pretty confident the other driver’s insurance will pay most of the car out—he paid $39,000 out the door for it, which is part of why he flew to another state to get it—and his may have to pay the remainder. He said he hopes it’s totaled out so he can effectively start over, and then find another gray Civic Type R.
In the meantime—am I the only one who suddenly feels like they could soon be in the market for a cheap salvage race car? Has Honda Even Made Replacement CTR Panels Yet?